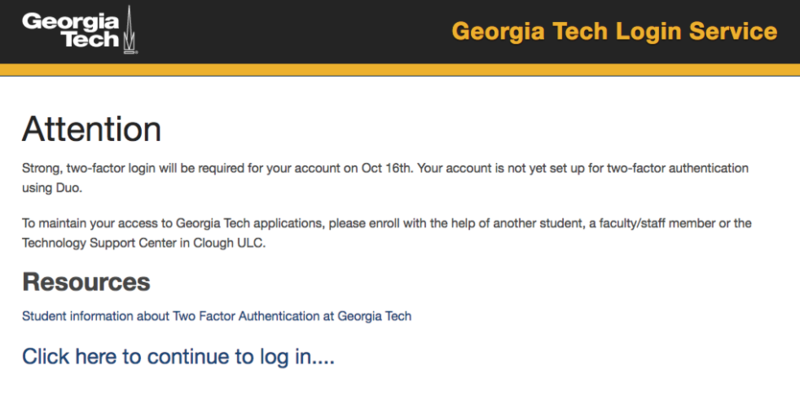 Those who have logged into their Georgia Tech account recently may be redirected to a page calling attention to the system’s new two-factor login. The page states that this must be achieved by Oct. 16 to continue accessing one’s account. authentications are already implemented by various other organizations that handle sensitive information. Users are required to enter their credentials, as well as a code that may be sent to their phones, adding an extra layer of protection. However, the Office of Information Technology’s (OIT) current efforts to convince students to enroll may be inadequate. Unfortunately, the message may not effectively be conveying the necessity of adopting the new process. Moreover, attaining the safety measure means either taking out the time to seek out an enrolled peer to assist them, visiting the Technology Support Center in Clough Commons or going to Wreck Techs. One way of enrolling students by the deadline may be done by outsourcing the task to organizations, such as Residence Hall Association. PLs and RAs currently require all residents to attend certain meetings as it is. Having them also enroll their residents could mean reduced traffic at the relevant offices and also ensures a significant proportion of the student body is signed up. Greek organizations and other groups that meet weekly could also assist their members. Increasing visibility by putting up posters or banners in Clough or other high-traffic areas could remind students to visit OIT or ask their friend to help them. Although well-intentioned, OIT may need to improve their efforts to convey the urgency to enroll in the safety measure to avoid increased traffic at their office and meet their deadline for enrollment.